Two of the six rare choughs controversially released into the wild in Cornwall have died. English Nature, the National Trust, and the RSPB warned against the release of the birds, which was less than a month ago. They said birds bred in captivity would struggle to survive in the wild. One bird drowned in a cattle trough, while another was killed by a peregrine falcon. Hayle-based Paradise Park Wildlife Sanctuary, which released the choughs, said the other four birds were still doing well. 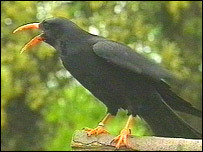 They said birds could suffer such deaths in nature, and the risk was worth taking to re-establish the chough in Cornwall. English Nature said the death of the two birds was a "great shame". The release of the birds was the culmination of Operation Chough - a project set up by the privately-owned sanctuary 16 years ago. The aim was to return the birds - the emblem of Cornwall - to the county. 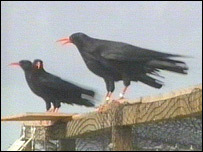 Cornwall also has a small colony of wild choughs, and English Nature officials feared a potential mixing of blood lines.